The seasonal change is well underway. Colder temperatures have now started to become the norm along with bare trees, frantic squirrels and days where the sun seems to vanish promptly at 4 o’clock. This annual cycle is reflected in our homes as well. Not only do colder temperatures change the activities that we pursue along with the hours that we keep but it even affects the way that we want our spaces to look. Changing up our decor as the months go by is a natural way for us to mark time. Not only does it keep our rooms visually interesting, but it also helps to keep us from feeling like we’re standing still as if the spaces that we live in don’t change along with us as we go through the year. As a result. whenever the change of the seasons comes around, we typically find ourselves wanting to invest in a few cosmetic improvements that will bring a fresh new look to our favorite spaces. At the same time, when the seasonal shift also means the onset of some very different climate conditions, the changes you’re looking to make aren’t just cosmetic, they’re functional as well. Usually, we keep the functional side of things and fashionable side of things more or less separate when we’re decorating. But even within that dichotomy, it’s always important that any alterations that we make to our decor, even the functional ones, only help to make every room in our home feel a lot cozier for the new season. When cozy is a combination of physically comfortable and visually appealing, that can get to be something of a tall order. That’s usually why we spend so much time at the beginning of each season — especially summer and winter — searching for inspirational images, tips and outright help for figuring out what our homes are supposed to look and feel like during each season. Well, look no further, because everything you need for a visually stunning and highly comfortable transition into the chilliest months at the end of this year and the beginning of the next can be summed up in just 5 simple accessories. That’s right, no major color changes or furniture overhauls. Of course, those things are always an option, but if you want to keep it simple this year, we're going to give you five accessories that you are going to want to put money into your home so you are ready to snuggle up and get ready for some quality time indoors this winter. Beautiful, artistically designed lighting solutions are one of the highlights of any interior and the winter season is the perfect time to light up your home. In the spring and summer months, natural light is far more abundant, which means that you are more likely to be able to cover all of your home’s lighting needs with no more than an overhead light fixture. By this part of the year, however, the early waning of the daylight means that your indoor light will be on for longer hours and you’ll probably notice that your overhead fixture could use a little help from smaller, more specific lighting from table and floor lamps. This type of secondary lighting becomes crucial once we move into the colder months, but finding the right combination of lights can be a challenging process. One of the most comprehensive basic lighting layouts to use for a living room space is to have at least one of each type of lamp: a floor, table, and task lamp as well as an overhead fixture. It’s likely that you won’t often use all of your lighting options at once, but covering all of your bases helps to ensure that whatever level of light you need will be present and available for you in whatever corner of your home needs it most. The winter season is all about layers. It’s true in terms of our cold weather wardrobe, and it’s just as true for our home decor. Where summer can afford to be more sparse in both clothing and home textiles, come the later points of the year, it’s time for all of those additional elements that have been in storage for the last few months to come back into play. As we near the end of the year, look for winter blankets that are 100% wool or cotton, and that have a bit of heft to them when you pick them up. The good news is that all of your favorite stores and designers are well aware of your winter needs and the stores are stocked accordingly. 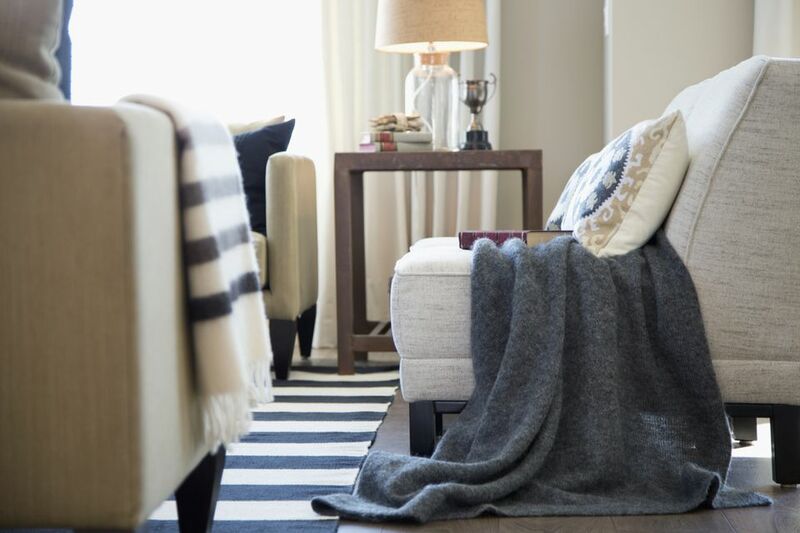 In the marketplace right now your options for throw blankets are endless, so focus on finding something that really fits your personal style. Now is the time to start thinking about whether you are all about boho chic, mid-century modern, country living or Scandinavian mod. The better you understand what you really like, the more it will help to narrow what is sure to be a massive selection of throws. But make sure to grab one quick because you want a knit blanket to snuggle up under before it starts to get really cold outside. Many of us are not fans of the cold, but we shouldn’t let that fact alone give winter a bad name. Cold weather may mean needing to keep more blankets on hand, but having an excuse to fill your room with more textiles is never really that bad of a thing. You’ve probably heard this before, but it bears repeating: whatever’s true for throw blankets in your space is even more true for pillows. If winter is a great excuse for bringing in your favorite throws, it’s an even better reason to indulge your pillow obsession. Every season calls for new accent pillows, and winter is no exception. This is definitely the right time to consider adding in some Mongolian fur or sheepskin pillows to your sofa or bed for that little extra bit of warmth. Interior decorating in the winter season is all about staying warm and comfortable, no matter what the weather is doing outside, so look for oversized 24” pillows and floor cushions to lounge on at home. When looking to load up on pillows, keeping the colors simple and neutral prevents the sofa from looking overly crowded and the patterns from seeming out of control. If you have one of those thin kilim rugs or a cowhide in your living room you may want to consider purchasing a second rug to layer underneath this one for the winter. This is especially true if your home has hardwood floors. As it starts to get cold outside, the extra cushioning underfoot is sure to come in handy. This is a perfect combination for giving chilly winter toes the relief they deserve. A cowhide rug over a natural jute fiber area rug not only promises to keep your feet warm, but both also add an organic feel to the space. The natural texture of both rugs, combined with their neutral colors helps to complete the soothing feel of this space. If there’s one goal that all winter decorating has in common, it’s the defense against the elements, and there’s nowhere that that become more important than at your windows. Conventional window blinds just aren’t going to do it during this time of year. Thick, high-quality window treatments are the answer for keeping the warm air in and the cold air out. Similar to throw blankets, when choosing curtains, you want to look for drapes that have weight to them, and are not sheer. It’s also important for curtains to have lining as that’s the insulation that will keep things warm and toasty. Homes with roman style shades should consider layering with blinds and also make sure they are lined so they keep the cold air out, and keep the heat in. The practical reasons for going with curtains in the winter are clear, but we can’t discount the aesthetic aspects as well. With the right colors, there’s no end to what curtains can do for your space, whether as accents or as the major pop of color in the space. Here, gold curtains provide a strong dose of color to bring this black and white space to life. Standing out against the backdrop of the rest of the room, they become the visual focal point that pulls the space together.